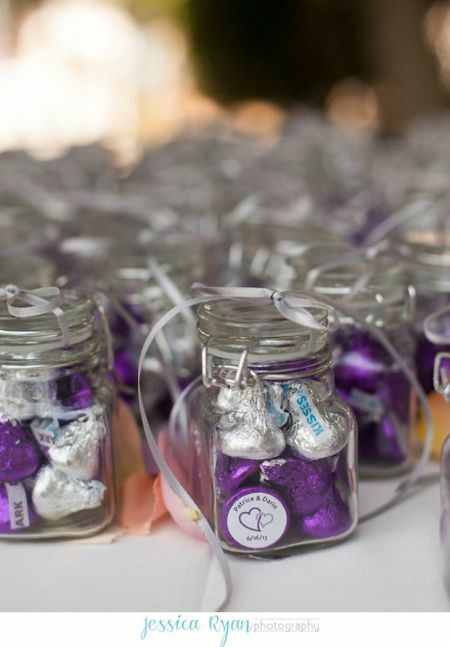 Hershey Kiss wedding favors are right here, so pucker up. Once you have decided that nothing but a Kiss will do, your thoughts will turn to presentation. 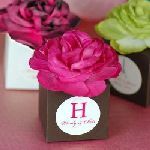 We welcome you here to take a look at some memorable and charming wedding favor presentation ideas that will wow your guests. These suggestions range from classic to contemporary and are versatile, elegant, and above all, beautiful. 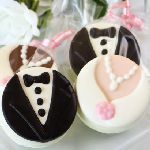 Whatever Hershey Kisses wedding favor ideas you decide to use, enjoy and take pleasure in the results on your magical day. No one can turn down a kiss, especially a Hershey one. From beach scenes to hearts to fairy tales, there are tons of pictures from which to choose. There are so many designs that we are certain you will find one that fits your taste. It's easy to create Hershey Kiss wedding favors as unique as you and your groom. These sweet treats began in 1907, and some claim they are the most popular and most recognizable candy of all time. Each comes in the classic foil wrapper with a small round sticker on the bottom. That sticker can be personalized with any picture or text. 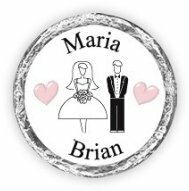 The bride and groom's name, initial, or wedding date are popular choices. This comfortable neutral palette is especially helpful in giving this favor presentation a vintage look. 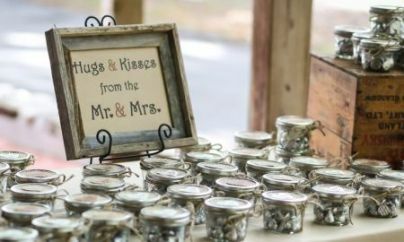 Mason jars filled with silver Hershey kisses continue the neutral theme, while the only hint of color is reflected in the sign. Exuberant jewel tones are a delightful choice for wedding favors. Bold strokes of color brings vibrancy to this display while the gold accents strikes a balance, resulting in a restful presentation despite the vivid hues. 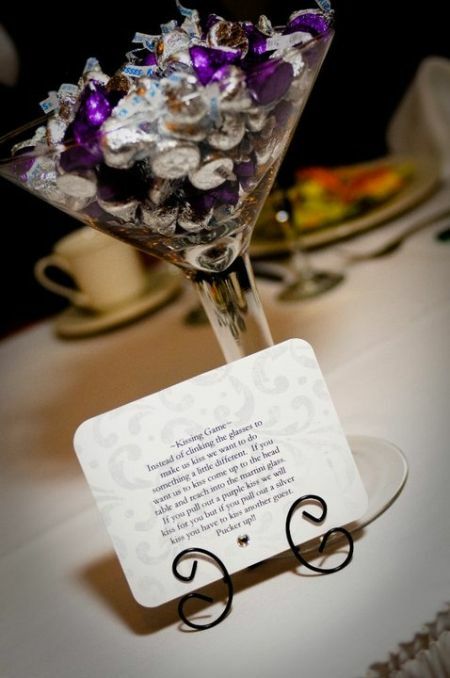 To make your Hershey Kiss wedding favors more pleasing than energetic, limit the strong colors. Creating harmony with multiple colors is perfectly executed here complete with personalized cards, candies, and shot glasses. This wedding favor is perfectly cohesive because color ties everything together. Clearly, the eye is drawn to the monogrammed Hershey kisses with a big thank you attached. Sometimes one burst of color is just the thing to provide optimum visual interest. Here, color is not the only thing working to grab attention, a large group of the same makes a big statement. You would never have a wedding without flowers, but flowers are not the only way to make an impact. 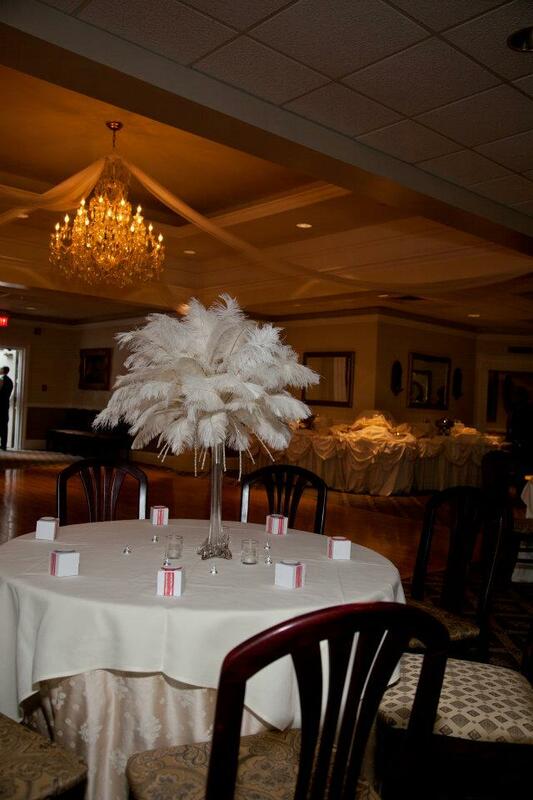 This tall vase of ostrich feathers adds drama and also gives guests seated at the table the opportunity to converse. 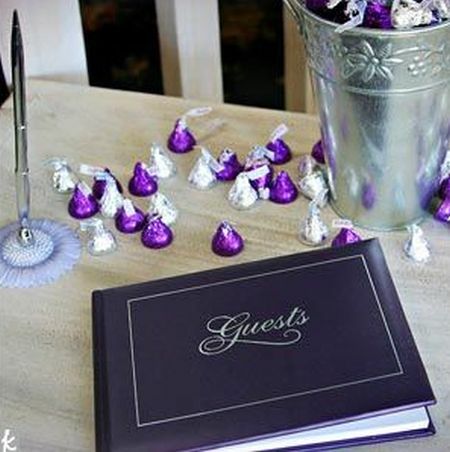 The multi-layered table coverings are a perfect backdrop for the dressed up boxes filled with Hershey kisses. We love how the pink ribbon adds the only color to this otherwise neutral table. Small votive candles scattered around the centerpiece further enhance this elegant look. The entire tablescape is romantic, modern, and flawlessly breathtaking. The question of who kisses who is all determined in this martini glass. If you pull out a purple kiss, the bride and groom will kiss. A silver kiss means you kiss another guest. 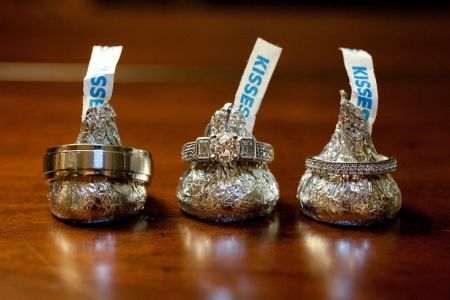 It's magic when you unite an old wedding tradition with your newly personalized Hershey Kisses. Circles of tulle gathered up with Kisses, tied with a coordinating ribbon, and Mr. & Mrs. tag makes up a favor with purpose. A ring of the bell signals the couple to kiss, while providing the guests a kiss of their own. 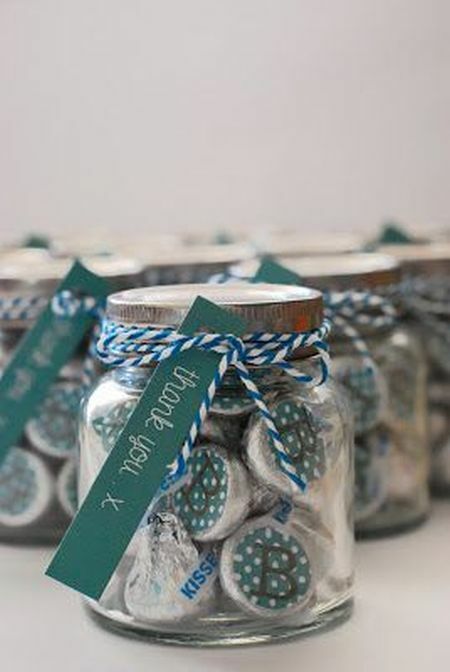 Hershey Kiss wedding favors can easily be created at home. 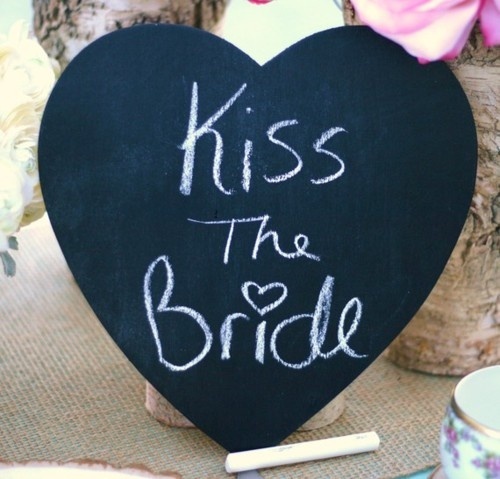 We love this fun favor for the guests, and love the great excuse to smooch for the Bride and Groom. 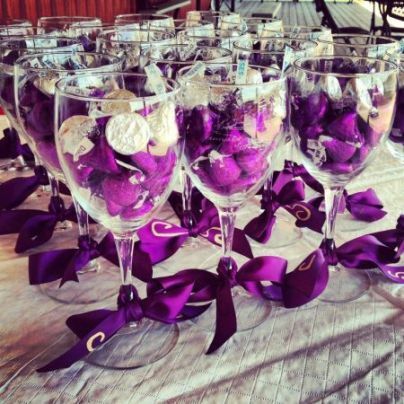 We are of the opinion that the presentation of the wedding favors is the final chance to show off your style. That is why we love this compelling favor display. 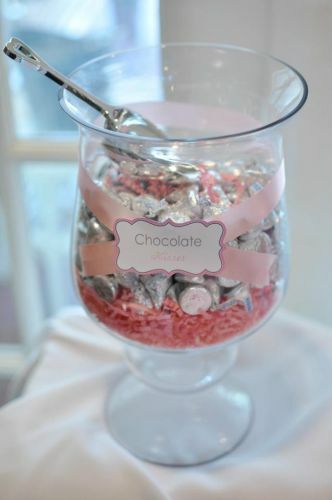 The champagne glasses are clearly sophisticated, while the pink Hershey Kisses add a splash of color. The gold textured tablecloth and sculpted frame complete the regal look. Consider monogramming the glasses for the ultimate personalization. 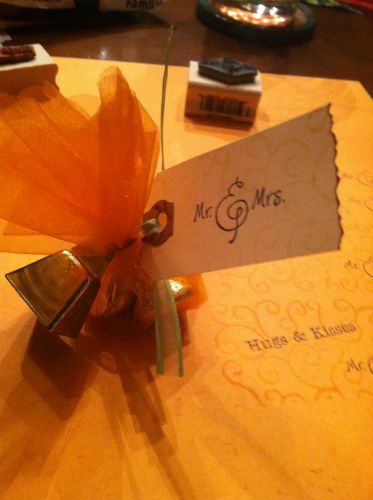 Here's to Hershey Kiss wedding favors. Candy instantly puts your guests in a festive mood, which is why candy buffets are very popular today. 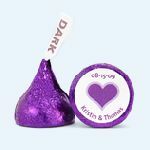 Hershey Kiss wedding favors are an expected choice and one of the most appreciated. The clear container makes the Kisses easy to spot in an array of heavenly treats. Notice the filler used at the bottom of the container-another bright idea. If you are creating your own candy bar, remember to try a trial run. Arrange empty containers of various heights and sizes on a table the size of the one you intend to use. Label containers as to what candy goes into each. Take a picture so you can clearly remember which look you liked best. 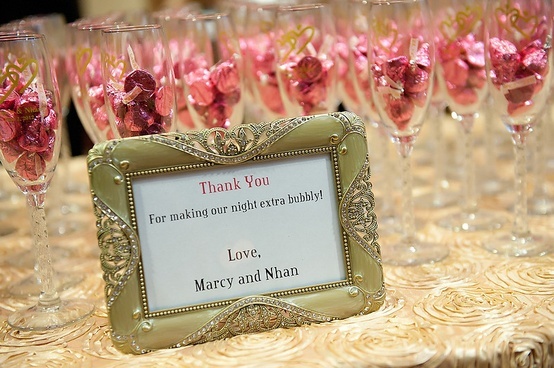 Guests will enjoy serving themselves and you will enjoy creating a sweet scene at the reception. 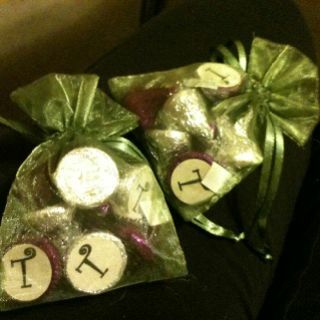 Garden themed favors compliment almost any style. This natural, yet modern favor will be a source of conversation for your guests. Nature lovers will love it, and everyone will be impressed with the unique design. 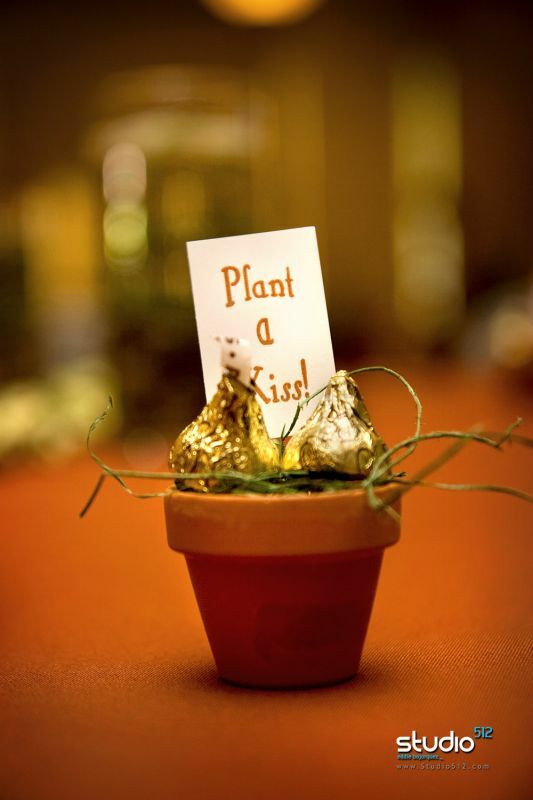 Small clay pots, fake grass, gold Hershey Kisses, and mini-signs work together to produce a wedding favor with an earthy feel. We were impressed with how budget friendly this wedding favor is to make, less than a dollar. Shopping ahead to find needed items on sale is the key. These beautiful drawstring bags filled with Hershey Kisses captures the blessed event in one small bag. The simple initial looks sophisticated and classic, not to mention the taste is always a favorite. Or, simply diy for a similar look. 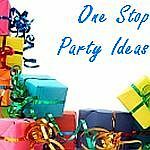 Purchase tulle, netting, or cellophane, and ribbon that compliment your wedding colors. Take about 3 or 4 Kisses and place them in the tulle. Gather up the edges, and tie a ribbon around each bag to hold kisses in place. Add a small personal note or poem to make it uniquely you. 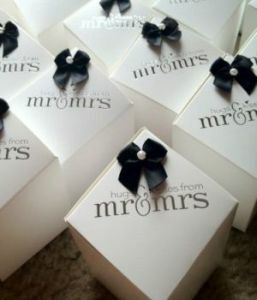 Give your guests Hershey Kiss wedding favors all boxed up and ready to go. What's inside the box may be really sweet, but it is the wrapping that commands your attention initially. You can diy or semi-homemade. Purchase the box of your choice and make it your own. Add ribbon, little bows, pearls, rhinestones or whatever you can imagine. The favor boxes shown below are some good examples of creativity. Send your guests home with Hershey Kiss wedding favors in one of these attractive burlap pouches. 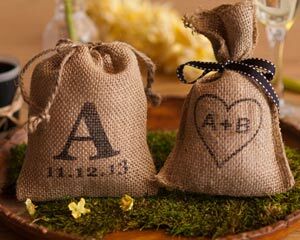 These rustic bags from My Wedding Favors are perfect to hold candies and match your style. Decorated with your choice of three designs, they become either a welcoming token at each table setting or a charming parting gift. Two contrasting colors were used to create this striking look. 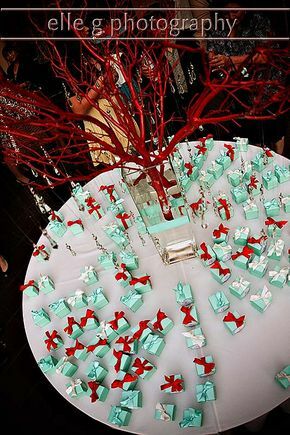 The decorative tree commands the center of attention, allowing the chocolate treasures underneath to surround the table. The sleek lines of this semi-formal setting complement traditional or modern settings. This presentation makes an immediate impression. 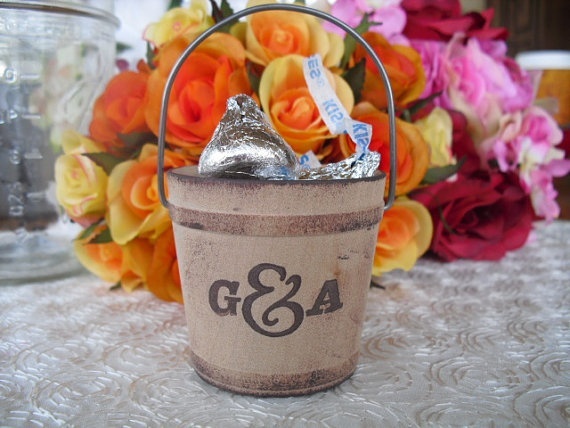 A personalized bucket filled with sweet Kisses make this wedding favor twice as nice. 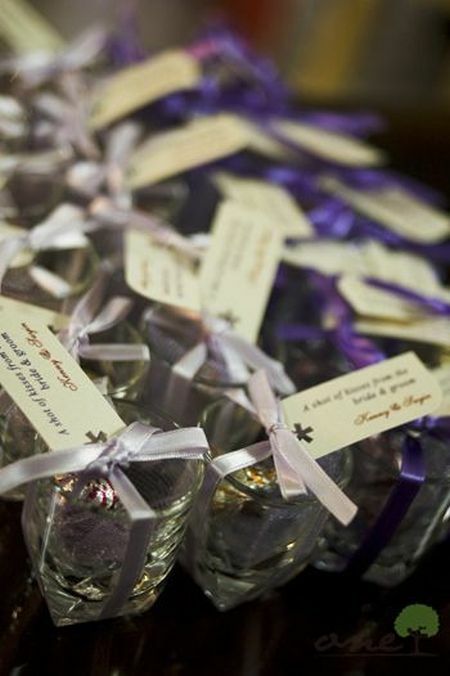 Make your Hershey Kiss wedding favors extra sweet with a special message. . . Include Hershey Hugs with your Hershey Kisses, and include a note with them. 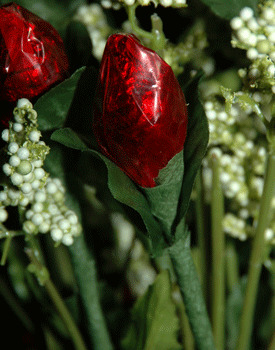 . .
Diy rosebud bouquets made from Hershey Kisses make impressive centerpieces and are so easy to do. 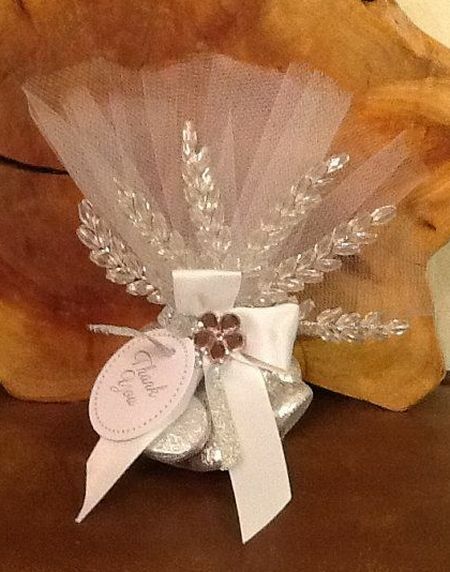 Hershey Kiss wedding favors make great decorations too. Sprinkle personalized chocolate treats on table tops or in decorative bowls or vases. Always plan to have plenty as one Kiss is never enough.